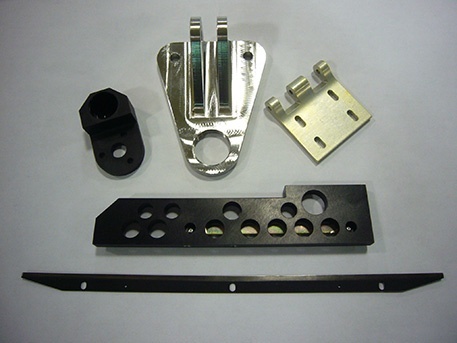 Black Anodize, Chemical film and Passivated parts show an assortment of coating options. Anodizing is great for corrosion control, cosmetic color and surface hardening. The most common anodizing process is the Type II. Note that aluminum alloys with copper, silicon and magnesium do create color variations from alloy to alloy and batch to batch. A very thin protective coating. Good for 336hr salt spray testing per Fed-Std-151, Method 811. This is the most common anodize, providing corrosion control and color. 14 common colors include black, red, blue, green, purple, gold and clear. Available in a natural non-dyed dark grey or dyed black. This is the same as the Hard Coat Anodize with a Teflon impregnation, usually by a trade name such as “Hardlube.” Common frying pan-like finish. A conductive coating for aluminum. Color options are clear and yellow. Available in hexavalent chromium free. Class 1a - Maximum corrosion protection, typically used for painted applications. Class 3 - Low electrical resistance on the surface enables dissipation of static electricity. Amorphous diamond coating on the central pin of this intensifier pump – just one of the special coatings that are available. 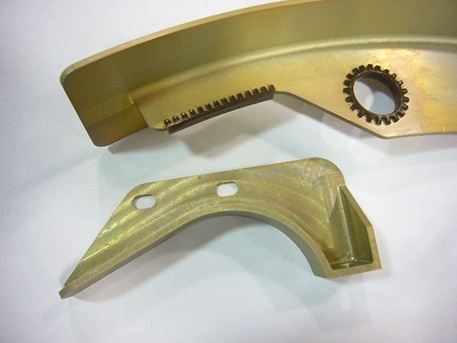 Zinc plating is the go-to process for rust protection of steel parts for most commercial applications, it is available in thickness and treatment type, clear and yellow dichromate and phosphate being the most common. Corrosion resistance is very good, available in various colors such a gold, iridescent, amber, black, and olive drab. Not used as much today due to environmental concerns from light metal chemical waste product concerns. Provides chrome corrosion protection, with a dark appearance. This is a thin, dense chrome that is hard (Rc78) and was developed to provide protection against corrosion and wear. Some processes are proprietary and trademarked such as Armology TDC. Automotive chrome for show or museum quality. Used for part restoration, with a highly polished surface. Plates uniformly in recesses and cavities. Does not build up on edges. Specified by thickness and process. Similar appearance to stainless steel. Class 1 is for corrosion resistance and decorative purpose. Class 2 is used for enhanced wear and abrasion resistance. Used to build up worn or undersized parts and for protection against corrosive chemical environments. Provides mild corrosion resistance, and aids in minimizing light reflection. This process is supplemented with impregnated oil or wax. It gives a familiar gun blue finish as a subset of this process. Light TT is primarily used prior to paint. Heavy Mil-P has two varieties: Manganese (M) and Zinc (Z). 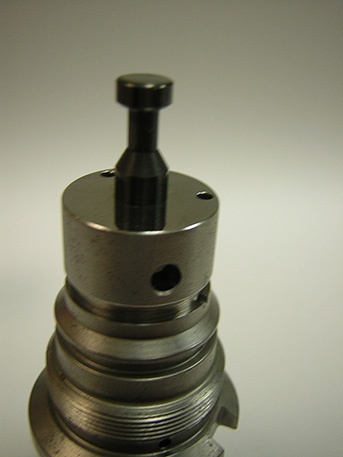 The M type is more resistant to alkaline environments, with moderate corrosion and wear. The Z type is for up to 200 Degree F applications, and prevents galling with good corrosion resistance. Many others are available, such as tin, copper, vacuum aluminum, vacuum cadmium, rhodium, silver, and gold. 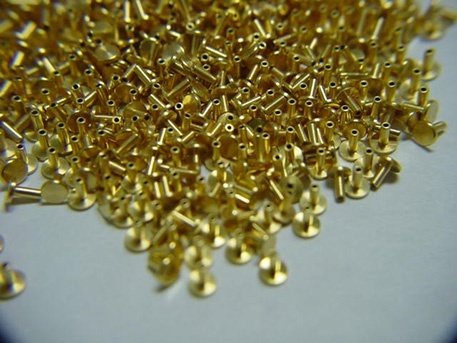 Gold Plated, Phosphor Bronze base electrical contact pin. Note: All chemicals processed should be reviewed to see if the steels are susceptible to a condition involving hydrogen embrittlement. This is a mode of material failure that is common when hardened materials as subjected to a hydrogen based acid in a chemical process. Special processes should be noted in a print or specification to prevent this condition. This usually involves an additional heating step, commonly called a “bakeout,” to be performed immediately after the chemical exposure. An etching process designed to remove foreign metals from the surface of stainless steel. Designed to promote corrosion protection. 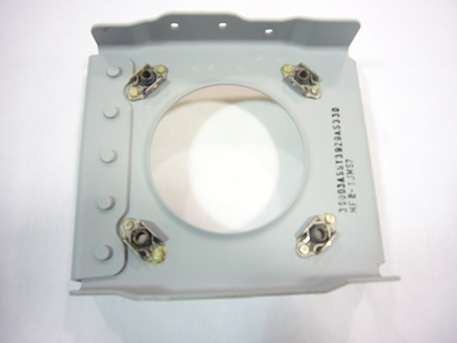 An electrical etching process similar to passivation but more aggressive, creating a uniform polished finish. May be used on all stainless steels, carbon steel, titanium, aluminum, copper, nickel alloys, nitinol, tungsten and other specialty alloys. Pretreatments may be blast- or wash-primer cleaning, or some type of coating such as chemical film. Special magnesium coatings are available as well, such as Dow #1, #7, #9 or #17. Primers for epoxy and e-coat primer are very common and supply excellent protection. Some of the options for top color coats can be epoxy based CARC or special whites, as well as heat resistant blacks. These are typically specification based or have manufacturing instructions. This only touches on some of the more common coating and finishing options that we have available. For more information on these or other options, please contact please contact Doug Wetzel or any of the Protomatic Sales staff. For a complete review of things to look for in choosing a CNC machine shop, please download the free guide, Tips for Choosing a Prototyping Machine Shop.